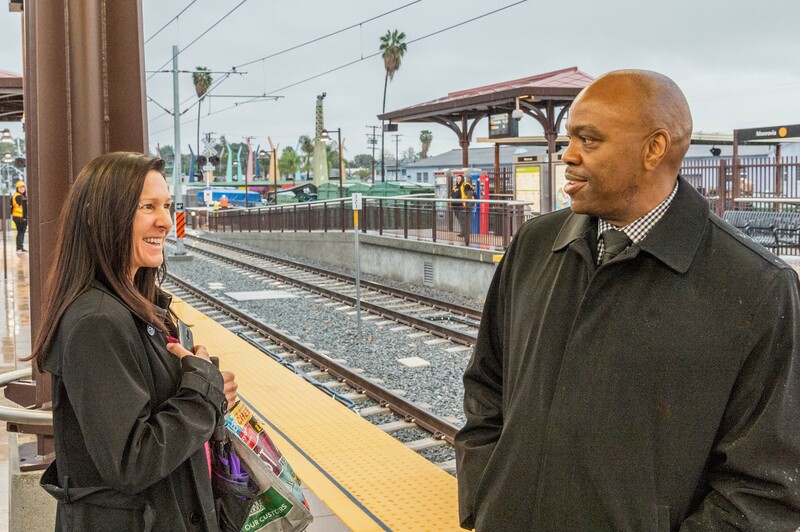 Metro CEO Phil Washington chatting with a customer at the Gold Line’s Monrovia Station in March. Metro’s CEO Phil Washington has now been on the job for one year. He was previously the general manager of the Regional Transportation District that serves the Greater Denver region and he oversaw a significant transit expansion program there. •One rail project has opened this year — the Gold Line to Azusa. And the long-awaited Expo extension to Santa Monica begins service on May 20. Three other rail projects funded by Measure R are under construction. •The Crenshaw/LAX Line is about half complete and a community celebration was held earlier this month. The rail line will connect the Expo Line, Los Angeles International Airport and the Green Line when it opens in 2019. •The NoHo to Pasadena Express began service on March 1, offering quick rides between the San Gabriel and San Fernando valleys. The express bus service uses the 134 freeway and connects job centers and key destinations in Pasadena, Glendale, Burbank and North Hollywood. •Staff has released the budget for the next fiscal year and it’s slightly less than the budget for the current year — even with construction projects underway and two new rail lines to operate. •Metro now offers a leadership program, the idea being to retain and help advance employees’ careers and take advantage of talent already working at the agency. Fifty-five percent of Academy participants are women. •The Office of Extraordinary Innovation is up and running. The new office will bring best practices in transportation and finance to Los Angeles County. A widely-attended industry forum was held in February to better connect Metro with the private sector and the office has received 12 proposals for new partnerships with the private sector. •Working with local officials across Los Angeles County, Metro has developed a potential sales tax ballot measure that would raise $120 billion for transportation improvements, including 38 projects. The plan is now under review by county residents and the Metro Board of Directors. •A new program called Operation Shovel Ready is working to prepare future projects for construction as soon as funding becomes available. •Metro continues to work with the Federal Transit Administration on securing a grant to help fund construction of the second section of the Purple Line Extension to downtown Beverly Hills and Century City. •Phil has appeared at dozens of forums and community meetings around Los Angeles County in an effort to meet Metro customers and stakeholders. – The useful technology of the Telephone Town Hall needs to be expanded to more Metro committees, especially the difficult-to-reach Local Service Council meetings. And improve the followup drastically – my three messages have yet to be returned!! – Create online discussion forums for Local Service Councils and special projects. Single queue, drive-by social media postings are not the same thing as a discussion thread! The existing email contact system is near useless as requests are misdirected, ignored or worse treated like a mailing list request (looking at YOU, Crenshaw LAX project). – TAP still needs improvement with suggestions and pre-revenue *testing* feedback from the ridership. We do not have confidence in Metro staff to get it right by themselves. Whether Measure R2 passes or not will determine his legacy.